1 # breakfast sausage mild or hot. 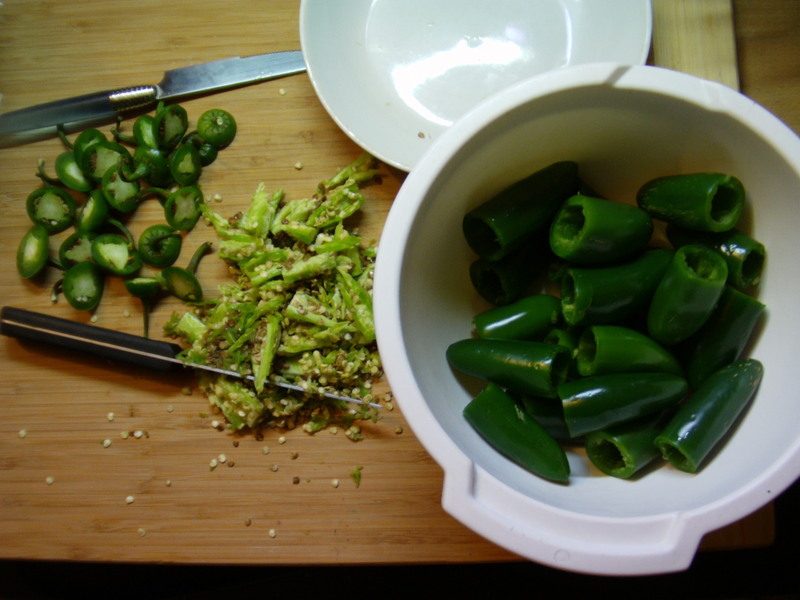 Cut the tops off the jalapenos and with a thin knife bore them out to remove any seeds and pith. Some recipes call for halving the peppers lengthwise, but the presentation is best when you keep the body intact. now with a butter knife, shovel the cream cheese into the pepper. I find it's easiest to insert the knife with cheese on it and then use the rim of the pepper to scrape the cheese off the blade while you retract it. Do this until you have about 1/2" of room left in the top of the pepper, you'll have to use a finger dipped in water (or the cheese will stick to you) to force all the cheese into the bottom of the pepper. Once all the peppers are cheese stuffed, move on to the sausage. take a spoon and scoop a small meatball sized portion of sausage and cram it into the pepper, on top of the cheese. You'll want to use enough per pep so that the sausage mushrooms out the top just a bit. Finish all the peppers similarly and grab yer bacon. 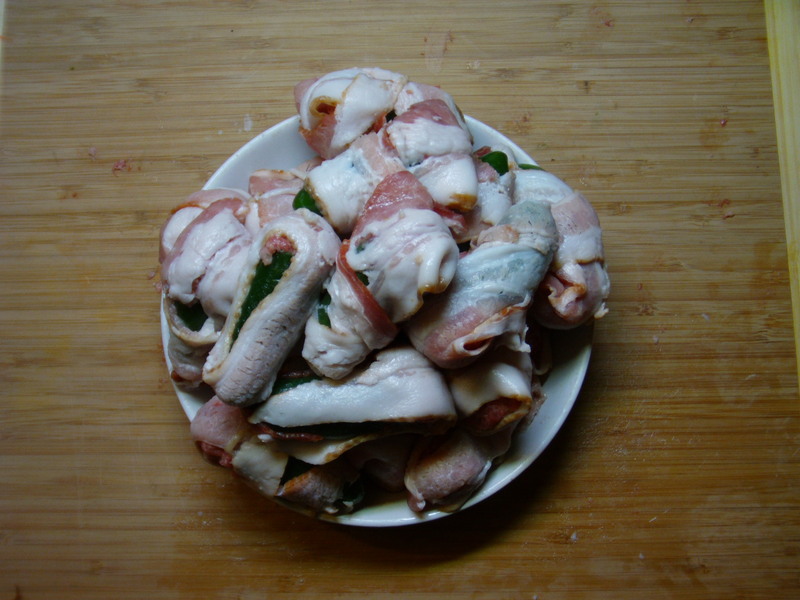 I like to wrap each pepper with one whole slice of bacon, so try to get peppers that aren't too small (bacon has to be cut or double wrapped) or too large (bacon covers only half the pep). Start by placing one end near the opening on the pepper and cover the sausage (to hold all the stuffing inside), then wrap around the bottom of the pep and wind it back towards the top in a spiral shape. Don't worry if you haven't covered all the stuffing, the sausage will hold itself together, just make sure the bacon is wrapped on tight enough so that it won't fall off easily. To cook, set your smoker for about 275F, though these are very forgiving on time and temps. They should take about 2.5-3 hrs, but I always pull them when the bacon looks like it won't be too chewy anymore. You can use whichever type of wood to smoke with, but my favorites are maple or hickory. *disclaimer* smoking jalapenos takes a good deal of heat out of them, but like all peppers, the heat varies from each individual pepper. so if you're serving to a wide audience, let gradma know that there's no way to tell which ones are safe. 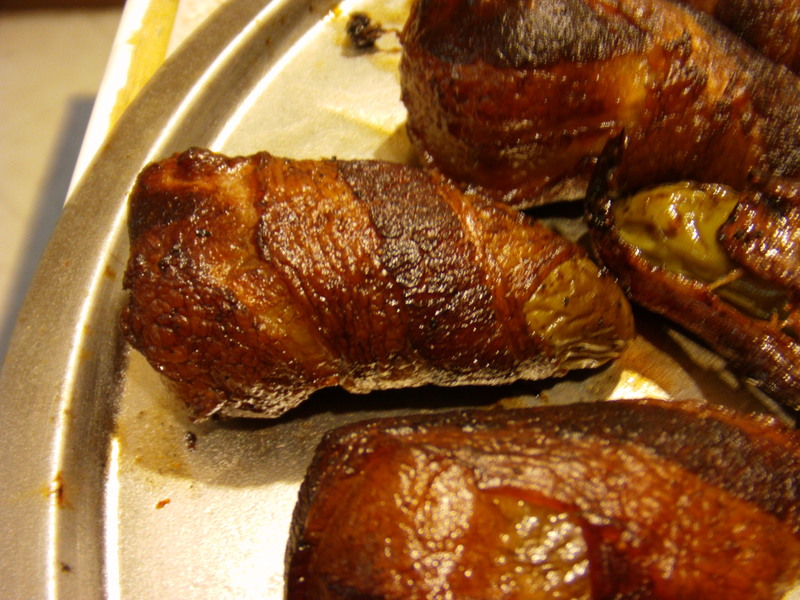 I have wanted to do these for a while now.... have'nt had 'em with the sausage (damn good idea!)... one of my favorite things on earth.... freaking good! Damn you guys! 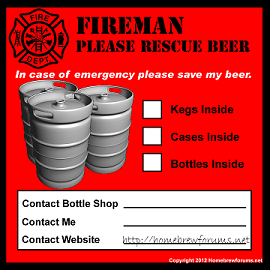 another thing to add to the "things I have to make that the flippin homebrew guys posted" list! I figured out a little trick today. Should have been obvious, but sometimes I'm slow. I set up a cutting board by my computer so I could assemble a batch while I watched netflix. I had my nice bright desk lamp on to grab a few pics of the process, when I noticed that if i held the pepper up to the light, they were nearly translucent. It made spotting any residual seed/pith much easier to spot. I'll upload some pics after I get these suckers on some smoke tomorrow. oh lord. sweet baby jesus, those look good. this really helped to temper the heat. 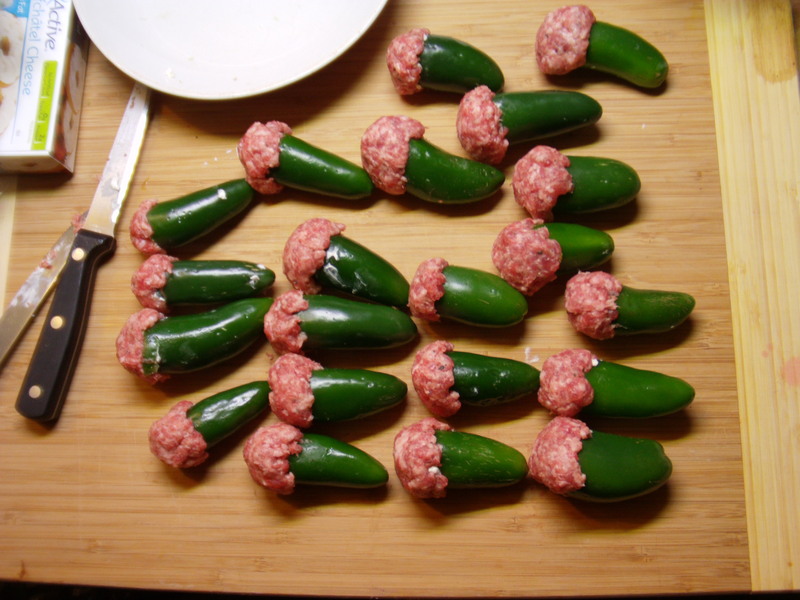 some still had a bit of a kick, but they are jalapenos, so that should be expected of them. So, I just found out my FIL has a smallish electric smoker he doesn't want. Those pics make me want to eat my phone. does it taste like apples? On the menu tonight. It'll be 9pm before they're done, but I don't care. I've done those before at the big Memorial Day cook we do with 50 of our closest friends and 50 of their closest friends and another 20 or so that end up finding it somehow else. yeesh, how many do you make? two dozen seem to take all day to prep. i can't imagine doing more than 50. Sorry, only a dozen or two for us doing the cooking. Delicious. 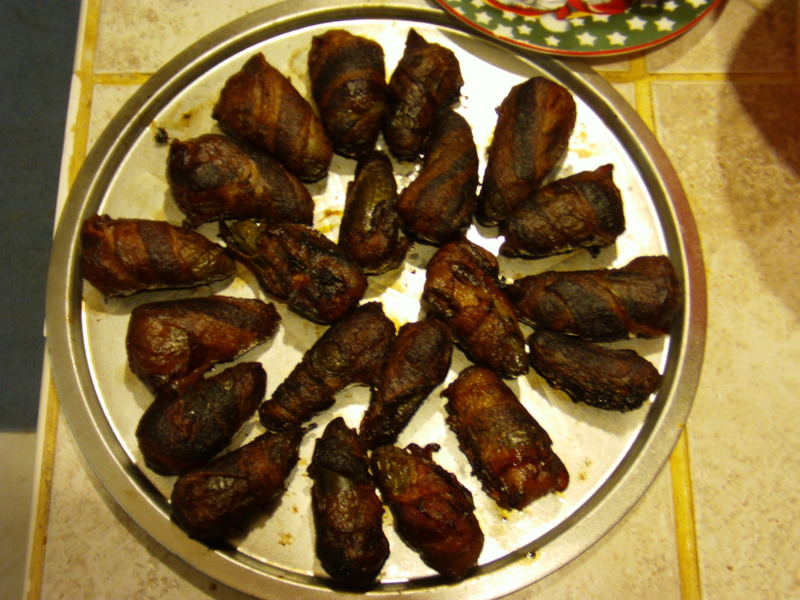 I overcooked them a bit, but the only real problem with that was extra crispy bacon. Anyway, epic good.